Over the course of the summer I’ve noticed bugs on my rhubarb plant. At least I think they’re bugs. 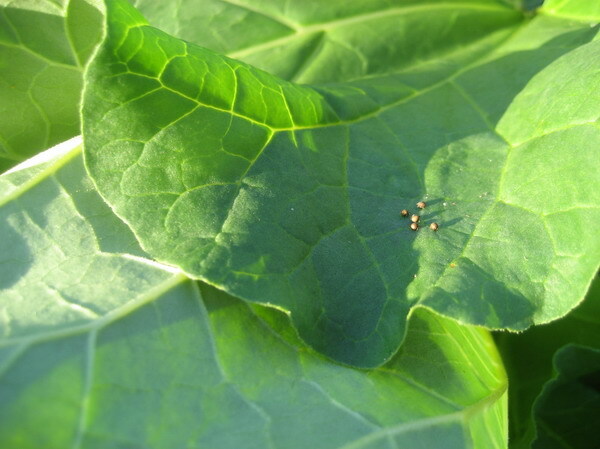 They look a lot like ball bearings, seem to do no damage (at least to the rhubarb leaves, which are poisonous), and typically collect near the base of the leaf where it meets the stalk. Upon closer inspection they are either ball bearings with tiny legs, or not ball bearings at all. 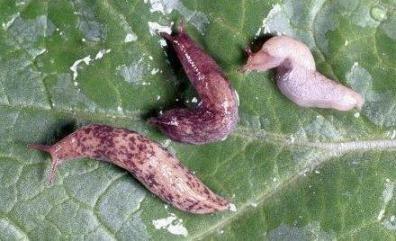 This entry was posted in Urban Gardening and tagged insects, pests, rhubarb on September 10, 2010 by local delicious. When I chat with other gardeners we invariably get to the subject of bugs. When I mention that I spray for aphids and other pests using a garlic spray, they always want to know the recipe. It’s late in the season to be worrying much about bugs, but I’ve heard several people say things like “aphids got my beans” or “I had a real problem with whiteflies this year” so it’s worth taking note for any winter gardening you may do, as well as prepping for next year — after all, isn’t the whole purpose of autumn to plan for next year’s gardening? Below is the recipe I got from a gardener I know. Search “garlic pepper spray” online for other variations. Pulverize peppers, onion and garlic bulb in a blender with a little water. Cover mash with a gallon of water, let stand 24 hours and then strain. Spray directly on plants. Effective against aphids, cabbage maggot, carrot rust fly, leafhoppers, mites, thrips and whitefly. This entry was posted in Urban Gardening and tagged garlic, organic pest control, pests on August 27, 2010 by local delicious. Well, the gardening year is off to a stunning start in the pest and pestilence departments, and it promises to be a busy season of remedies and intervention — organic of course. With all of the moisture and cool temperatures we’ve had, slugs are having a field day in the community garden. My plot has not been particularly hard hit relatively speaking, but the slime masters have definitely enjoyed more than their fair share of my pole and bush bean sprouts. Two weekends ago before I planted my lettuce I spent a couple of hours enduring a Saturday afternoon of misty rain — getting rather damp in the process — on serious slug patrol. They definitely let their guard down in weather that any normal person would know to come indoors from. In some cases, the slugs were quite effective in blending in and only when I’d crouched still, thoroughly surveying a small area was I able to spot them. There were also some really big, nasty buggers (it’s okay to say that when they are, in fact, bugs). On the question of preferred method of disposal, we gardeners are of differing opinions. Normally an advocate of non-violence, I chose the cut-’em-in-half method as it seemed the quickest. My mom uses the put-them-in-a-bag suffocation method. When I discussed the relative pros and cons with some of my fellow gardeners, one of them pointed out that at least suffocation is painless (loss of oxygen, falling asleep, dying) vs. the more abrupt, barbaric method I’d chosen. He has a point. Plus there’s less slime and goo to deal with. Aforementioned earlier comment aside, salt seems unusually cruel. This entry was posted in 16 Oaks Community Garden, Urban Gardening and tagged bugs, garden bugs, organic pest control, pests, slug patrol, slug remedies, slugs on June 8, 2010 by local delicious. 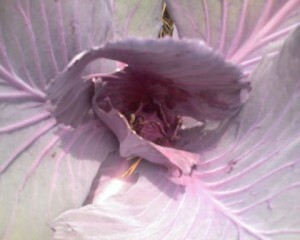 Something has completely gorged on one of my red cabbages. The entire inner, most tender young leaves have been eaten beyond salvage. I thought about ripping out the plant, but perhaps it’s better to leave it there as a bug decoy? This entry was posted in Bumbling Gardener, Urban Gardening and tagged pests, urban garden on July 25, 2009 by local delicious. I opened the vegetable drawer in my fridge yesterday and found this fellow feebly waving his legs, going nowhere fast. I think he traveled home with me in a bag full of freshly harvested kale and broccoli leaves. My first reaction was to slam shut the drawer, despite his slow moving efforts. Have I mentioned that I do not have any warm, fuzzy sentiments for bugs whatsoever?! With some fear and trepidation lest he be a quick recovering, flying big brown bug — yes, I am fully aware of our difference in size, thank you — I grabbed my phone camera and snapped this pic. THEN I slammed shut the drawer. 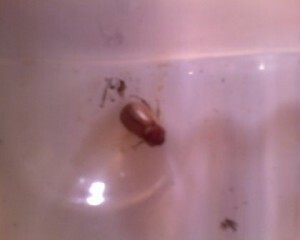 Can you tell me, is he a good bug or a bad bug? If the former, I will put on a couple of pairs of gloves and attempt a capture and release like I do with spiders (but only because they eat nasty bugs). Otherwise, he’s there till he dies at which time I will put on a couple of pairs of gloves and attempt a capture and flush. This entry was posted in Bumbling Gardener, Urban Gardening and tagged bugs, garden bugs, pests, Urban Gardening on July 8, 2009 by local delicious.